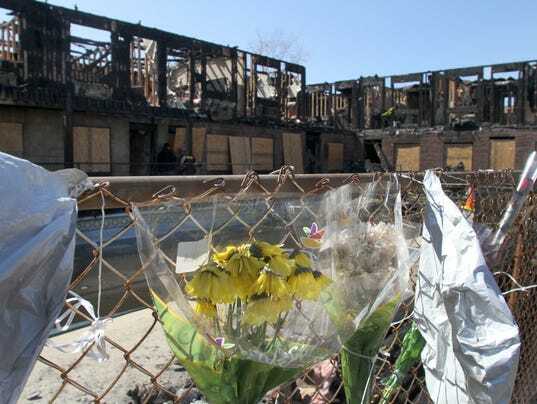 POINT PLEASANT BEACH, N.J. -- Hundreds of motels along the Jersey Shore, are not required to have fire sprinklers, under a state law that grandfathered the inns from having to provide the life-saving equipment, fire safety experts said. The issue has taken on greater focus here since Friday's deadly fire at the Mariner's Cove Motor Inn, which killed four people. Officials have not said whether the motel had a system in place, but survivors at the motel say there were no working sprinklers or fire alarms. David Kurasz, executive director of the New Jersey Fire Sprinkler Advisory Board, said the absence of fire suppression sprinklers is an ongoing and largely unknown risk that the public takes when checking in to the "mom and pop" motels that are such an iconic feature of the Jersey Shore. "All of these motels, some built well before the 1980s, and all are grandfathered into a fire code that didn't include sprinklers," Kurasz said. John H. Lightbody of Toms River, past fire district chief and current fire insurance investigator for Valentine Associates, said at least 200 motels on the Jersey Shore are not required to have sprinklers. Statewide, he said there are hundreds of motels. Built in 1984, the Mariner's Cove Motor Inn would not have had to include a fire-suppression sprinkler system when constructed, according to the state of New Jersey. "There was no requirement for this type of building to be provided with a fire sprinkler system," said Lisa Ryan, a spokeswoman for the state Department of Community Affairs. "There was a requirement for a fire alarm system." The state Uniform Fire Code has mandated that structures of this type have sprinkler systems only since 2006, but older buildings such as the Mariner's Cove Motor Inn were not required to be retrofitted at that time, despite the change in the law, Ryan said. A preliminary investigation has determined the blaze was started by an improperly discarded cigarette in a chair in an outdoor lounge. Authorities said the four men died from smoke inhalation. Seven other guests at the motel were injured. No criminal charges have been filed and investigators were still trying to determine whether there were any functioning smoke alarms in the motel at the time of the fire.